Tri tip is a rarer cut of meat that comes from the bottom end of the sirloin. It gets its name because it is triangular in shape. It is a fairly tender cut of meat and well suited to quick cooking over high heat. While often grilled, you can also cook tri tip in a cast iron skillet. 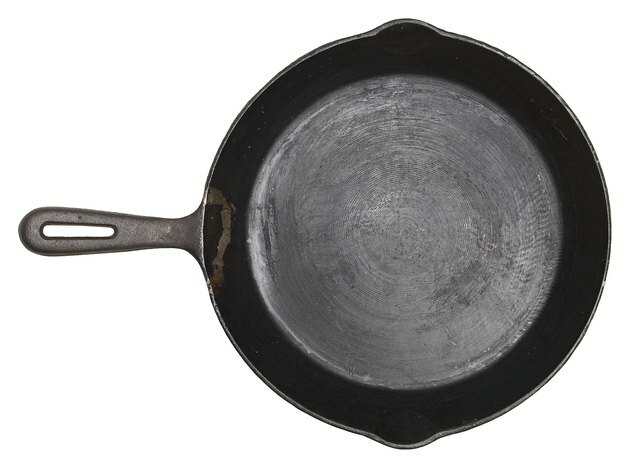 Cast iron is preferable because it distributes heat evenly and produces a good sear on the meat. Trim any excess fat from the tri tip steak using a sharp knife. Extra fat increases the caloric value of the steak and increases the amount of grease that splatters when cooking. Heat the vegetable oil in a cast iron skillet over medium-high heat and season your tri tip with salt, pepper and any of your favorite spices. Place the tri tip into the heated skillet and cook for approximately 5 minutes per side, turning with tongs. The meat should reach an internal temperature of 145 degrees F, as advised by the USDA. Remove the tri tip from the skillet and set it aside to rest. Resting the meat allows the juices to reabsorb into the tri tip for a more tender, juicy steak. Slice thinly and serve. Try grilling a tri tip over medium-high direct heat with your gas or charcoal grill. Wash cookware that you used to handle the raw tri tip with hot water and soap to kill the bacteria that can cause food-borne illness.